My former roommate is an avid traveller mainly due to the exigencies of his job and a sense of wanderlust to see the world. One of the perks for him is having the opportunity to visit a myriad of restaurants in various parts of the world. One year, back from a trip to San Francisco, he was exuding with delight about having a wonderful meal in an Afghan restaurant. Back then I was quite a connoisseur of Indian and Pakistani cuisine, but Afghan food was terra incognito within the realm of this palate. One for gastronomic adventure, I knew I had to delve into this cuisine and find a restaurant serving such offerings after hearing my friend speak about his meal. Being the kind and considerate roommie that I was, I would pick my mate up from the airport back from his frequent trips. 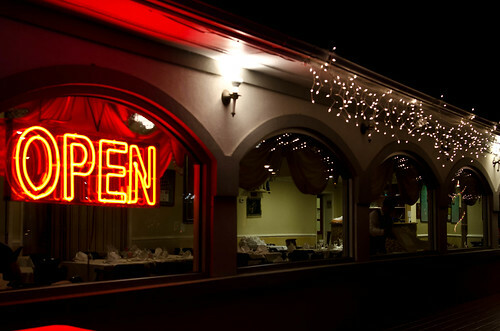 For many years, we had driven by a nondescript building off the main road, with a large drap-looking sign that barely made an effort to entice passersby into its dining room. 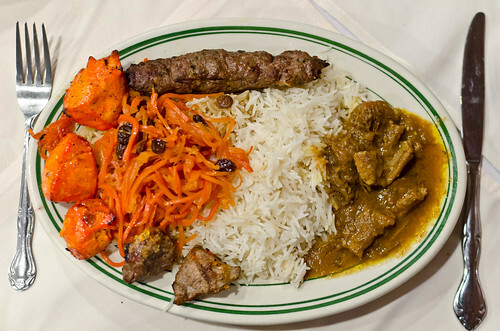 After hearing my friend’s exuberant remarks about this exotic cuisine, we decided to pay a visit to Afghan Restaurant in Crystal City, VA, a stone throw away from Reagan National Airport (No, it is NOT “Reagan Airport” as some folks seem to truncate the name to – that irks me!). It took a bit of suspension of first impression judgement to enter its doors, and since then, we have not stopped returning to this establishment for over 15 years. Always up for something unique and out of the common, the adventure for me starts with the first bite, or in this case, the first sip. 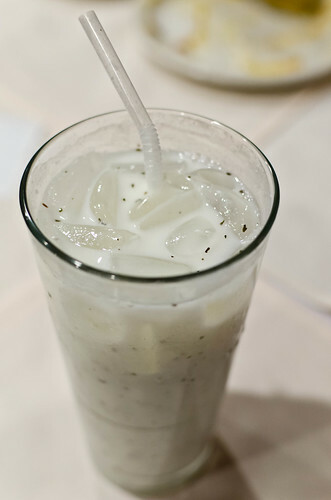 Dogh is a fermented yogurt drink that has been lightened with some soda water and slightly brined by a touch of salt. It has the slight creamy taste of whole-milk yogurt but this richness is cut by the mild sourness from the fermentation. In addition, flecks of dried mint add the bite and slight herbaciouness to compensate the dairy flavor. This drink is not for the novice and it is an acquired taste, of which my friends would wince and remark that it tastes like toothpaste. Not for me – it is uniquely delish! 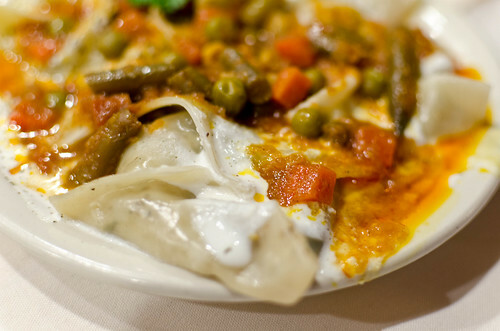 As for an appetizer, a favorite order is Mantu. These are steamed dumplings that are filled with scallions and bits of minced beef. The silky dough makes the perfect purse for the stuffing without being too thick or too delicate, providing support to the bits of not overly cooked scallion and morsels of tasty beef. The slathering of yogurt sauce along with a meat sauce made with a tasty tomato sauce and bits of vegetables makes this opener a tasty treat. What amazes me is the resemblance of this dish to the Mandu dumplings popular in Korean eateries. According to Wikipedia, the Mongols brought these meat purses from the Middle East to the Far East along the Silk Road in the 14th century – tasty bites with an interesting history. Along with the steamed dumplings, a baked version, Boolawnee, proved to be equally tasty during past visits. The mainstay in Afghan cuisine are the meat dishes, especially the Kebabs that dominate a large portion of the menu. The menu offers a variety to choose from: Chicken, Beef, Lamb, and Fish, in either whole pieces or in ground meat form. Over the years we have zoned in on a couple of them in part due to their savouriness and in other part due to personal tastes of the other sharers: Boneless Chicken Thigh Kebab and Shami Kebab. The chicken thigh version comes with pieces of chicken that have been marinated in a seasoning and perhaps in some yogurt to helps to tenderize these bits of dark meat. The chunks come slightly charred and with a light smoky taste from having been grilled over charcoal while the meat remains moist and savory from the seasoning. The Chicken Breast version is equally tasty and moist, but my dining mates prefer the stronger tasting dark meat. 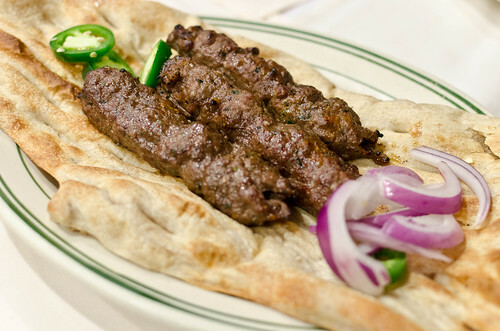 The Shami Kebab is made from ground beef with some seasoning, grated sweet onions, and a bit of garlic. These pieces of beef make a tasty bite due to the seasonings and it will even entice the not-so-beef eater. But one can’t forget the humongous piece of freshly baked naan bread that makes the obligatory partner to this meal. 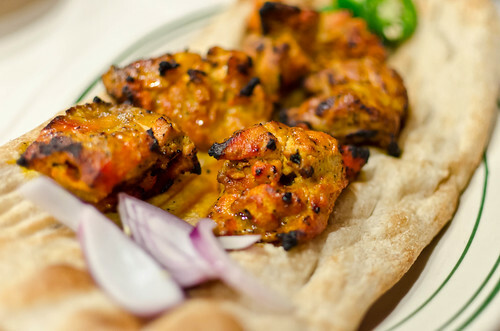 Pieces of dough have been cooked in the tandoor oven, providing a crispy outer shell with a moist stretchy fluffy inside. The customary way of eating the pieces of chicken and beef is wrapping them with Naan bread and slathering the sandwiches with the accompanying spicy cilantro yogurt sauce. This is a perfect combo that has you coming back and wanting more with each bite. A skewer of grilled onions, green peppers and tomatoes can be added to round off these meat dishes. Meat dishes definitely abound in this establishment. However, we have discovered that Afghan cuisine is not all about meat like in many Middle Eastern dishes. 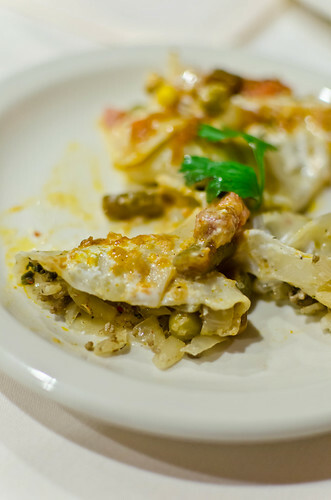 A section in the menu is dedicated to vegetarian dishes and they are worth discovering. The Vegetarian Rice Platter is the perfect partner to balance out the above meat dishes and it is a must order. 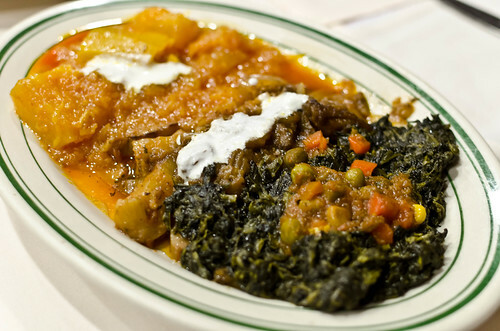 This quartet comprises of sautéed spinach, roasted eggplant, stewed pumpkin, and Rice Palau. The chopped spinach is well-seasoned with a tinge of sourness to counterbalance any bitter taste (none btw), the soft eggplant still in chunks and amazingly slightly sweet, the pumpkin soft and naturally sweet sitting in a small pool of rich ghee, and the grains of basmati rice fluffy, a bit oily and heavily scented by large cardamom pods that add some exotica to the lean looking grain. The topping of caramelized carrot shreds and plump raisins brings more interest to this starch and it attempts to steal the highlight. For my friends and me, our kebab dishes would not be complete without an order of this divine combination of vegetables and rice. This easily would satisfy the most finicky vegetarian/vegan customer who would not think finding something worth ordering in a meat-laden menu. As for my former roommie, he seems to order only one dish: Super Combo. It is definitely a combo that comes with a skewer each of chicken, lamb, and shami kebab, Rice Palau, along with a Qurma, a well-seasoned lamb stew. This is truly a meat delight for the die-hard carnivore to which my friend has taken his vows. The Qurma is very tasty with only a slight hint of the lamb gaminess that makes it palatable for the sensitive eater. It is a dish worth ordering to get a sampling of the different meat offerings in this restaurant and for the famished diner. The desserts are limited in the offerings. However, apart from the predictable Baqlawa (Baklava), there is Ferni. It is made with milk and cornstarch, and it is served chilled and topped with a dusting of pistachio bits. It is akin to the usual rice pudding except the texture is a bit funky, much like an over-starched sauce that has congealed up. Aside from this textural issue, it is a tasty dessert with a slight hint of Orange Blossom essence in the pudding. Definitely a favorite of my mega-canivore friend. In the best-selling novel, The Kite Runner, in which the author chronicles life during pre-Taliban Afghanistan, we see a frequently appearing character, Ali, who is the family’s long-time servant. He was faithful, constant, unassuming, and ever-pleasing. 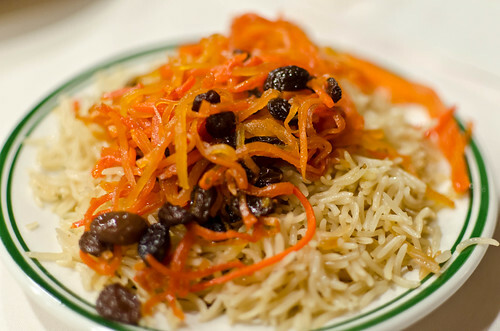 In more than the 15 years that we have been visiting Afghan Restaurant, it has demonstrated the very same qualities in the food that we relish in during our meals, never dipping in food quality or warmth in service. Just like the Ali character’s demure personality, or display sign in the restaurant’s case, one cannot discern beyond the looks, or in this case, how wonderful and enticing Afghan cuisine is unless he or she walks through those double doors. Or you may be invited to the wedding dinner in the banquet hall if you accidentally enter the adjoining room. Either way, the experience is never disappointing.